We previously reported the results of a randomised controlled trial comparing early surgery with prolonged conservative care for patients with sciatica over one year’s follow-up.10 In the current analysis we provide results for an additional year of follow-up and describe the pain and disability status of patients at two years. We conducted a multicentre prospective randomised trial among patients with 6-12 weeks of persistent sciatica to determine whether a strategy of early surgery leads to better outcomes than a strategy of conservative treatment for six months and delayed surgery for patients with persistent pain. The medical ethics committee at each of nine participating hospitals approved the protocol. Only centres with experience to diagnose and treat patients with sciatica conservatively and with at least 100 surgically treated patients a year were allowed to enrol patients. Written informed consent was obtained from all patients. Details of the design and study protocol have been published previously.11 The current study focuses on the differences between one and two year outcomes. Eligible patients were aged 18-65 years, had had lumbosacral radicular syndrome diagnosed by an attending neurologist, and had a radiologically confirmed disc herniation. Patients were included only if they had a dermatomal pattern of pain distribution with concomitant neurological disturbances that correlated to the same nerve root being affected. Before randomisation, participating neurosurgeons verified the indication for surgery and independently confirmed the presence of nerve root compression by a herniated disc by means of magnetic resonance imaging. This nerve root compression had to correlate with the presented clinical findings. Patients presenting with a cauda-equina syndrome or severe paresis (Medical Research Council (MRC) score <3) were excluded, as were those who had had identical complaints in the previous 12 months or a history of spinal surgery, spinal stenosis, deformity, or severe comorbidity. A computer generated permuted-block scheme was used for randomisation, stratified according to centre (n=9). One hour before randomisation, patients were again evaluated by independent research nurses, and any patients who no longer met the eligibility criteria because of recovery were excluded. The remaining patients were assigned to a treatment by the opening of successive numbered opaque envelopes containing the assigned strategy. Patients were notified beforehand that they were participating in a study comparing two different strategies for the timing of intervention rather than comparing surgery with non-surgical treatment. Obviously, they could not be blinded to the assigned treatment arm. Early surgery was preferably scheduled within two weeks of assignment and cancelled only if spontaneous recovery occurred before the date of surgery. The disc herniation was removed through an unilateral transflaval approach using magnification. Occasionally, at the discretion of the surgeon, a bilateral exploration was performed. The participating spine surgeons had ample experience in lumbar disc surgery and postoperative care. After annular fenestration and decompression of the nerve root, the potential but unsubstantiated high risk of a recurrent disc herniation was reduced by removal of loose degenerated disc material from the disc space using curette and rongeur, without striving for a subtotal discectomy. During a consensus meeting before the trial, the surgical method was discussed, and no alternative methods of surgery were allowed. The duration of hospital stay depended on each patient’s functional ability to mobilise. After discharge, the rehabilitation process was supervised by the patient’s physiotherapist at his or her office. Depending on the nature of their work, patients were advised to resume their regular jobs after six weeks onwards. Prolonged conservative management was provided by each patient’s family practitioner. Ample information was supplied about the favourable prognosis. Treatment comprised the prescription of effective painkillers according to prevailing guidelines and the advice to resume daily activities if feasible. A mobilisation scheme, based on time rather than pain, was recommended without checking the compliance. If patients had considerable fear of movement, guidance from a physiotherapist was recommended. Fear of movement was assessed by the family practitioner. The principal investigator instructed the participating practitioners, and if guidance about pain and disability became too complicated there was a low threshold to refer patients back to the hospital office of the research nurses. If sciatica persisted six months after randomisation, microdiscectomy was considered. Increasing leg pain not responsive to drugs and progressive neurological deficit were indications to perform surgery earlier, within six months. Before such surgery was discussed with patients, they were again evaluated by the research nurses, neurologist, and neurosurgeon to verify the progressive worsening of sciatica and radiological confirmation of a disc herniation was repeated. Primary outcomes were measured longitudinally over a period of two years by means of the Roland disability questionnaire for sciatica,12 a 100 mm visual analogue scale for leg pain,13 and a 7-point Likert self rating scale of global perceived recovery. The outcomes were assessed at 2, 4, 8, 12, 26, 38, 52, 78, and 104 weeks. Secondary outcomes—such as a repeated neurological examination, a visual analogue scale for back pain, functional-economic observational assessments (PROLO)14 by an independent research nurse, and quality of life scales15—were measured at monitoring visits scheduled at 8, 26, 52, 78, and 104 weeks. Research nurses observed their own patients at the planned follow-up visits and were aware of the patients’ treatment assignments. The aim of this study was to estimate the difference between the two treatments in disease-specific disability of daily functioning measured with the Roland disability questionnaire. Assuming a minimal recovery of 11 points and mean standard deviation of 10 points over the first year,16 140 patients would be required per treatment arm to provide a statistical power of 0.90 with a two tailed significance level of 0.05 to detect a four point difference in the disability score. Recovery corresponded to “satisfactory outcome” and was defined as complete or almost complete disappearance of complaints measured by a 7-point Likert scale. The other scores corresponded to “unsatisfactory outcome.” The ratio of the respective speeds of recovery was estimated using a Cox proportional hazard model, with results presented as hazard ratios with 95% confidence intervals. Differences between groups in the Likert score at two years were evaluated with Fisher’s exact test. Data collection and quality checks were performed with the ProMISe web-based secure data management system of the Department of Medical Statistics and Bioinformatics of Leiden University Medical Centre. For all statistical analyses, SPSS version 14.0 was used. Differences between groups at baseline and after two years of follow-up were assessed by comparing means, medians, or percentages, depending on the type of variable. Baseline values of variables were used as covariates in the main analyses whenever appropriate to adjust for possible differences between the randomised groups and to increase the power of the analyses. Outcomes of function and pain were analysed using a repeated measurements analysis of variance with a first order autoregressive covariance matrix. Estimated consecutive scores were expressed as means and 95% confidence intervals. Pointwise estimates were obtained using models with time as a categorical covariate to allow assessment of systematic patterns. Differences between randomisation groups were assessed by estimating either the main effect of the treatment or the interaction between treatment and time. As a second approach to quantification of the differences between the two groups over total follow-up time, “area under the curve” quantities were calculated between randomisation and week 104 and subsequently compared using Student’s t tests. All analyses were performed according to intention to treat. Between November 2002 and February 2005, 599 patients had a surgical indication for treatment of sciatica according to their family practitioner (fig 1⇓). After initial consultation with the neurologist, 395 patients met all inclusion criteria and were examined by magnetic resonance imaging. At the second visit the 283 patients who continued to have sciatica and in whom a disc herniation had been visualised were allocated to one of two treatment strategies. No significant differences in baseline characteristics between patients were noted for the two study groups (table 1⇓). The patients were equally distributed between the nine participating hospitals. Since 23 (8%) of the patients were lost to follow-up for various reasons, the study lost some power. Analyses without or including last scores carried forward provided similar results in Mantel-Haenszel analyses. Furthermore, baseline characteristics among dropouts were similar to those of the patients providing the two year follow-up data. Nevertheless, it remains possible that selective loss to follow-up occurred. Of the 141 patients assigned to receive early surgical treatment, 16 (11%) recovered before surgery was actually performed. They did not receive conservative care. Median time to early surgery for the remaining 125 patients was 1.9 weeks after randomisation (table 1⇑). 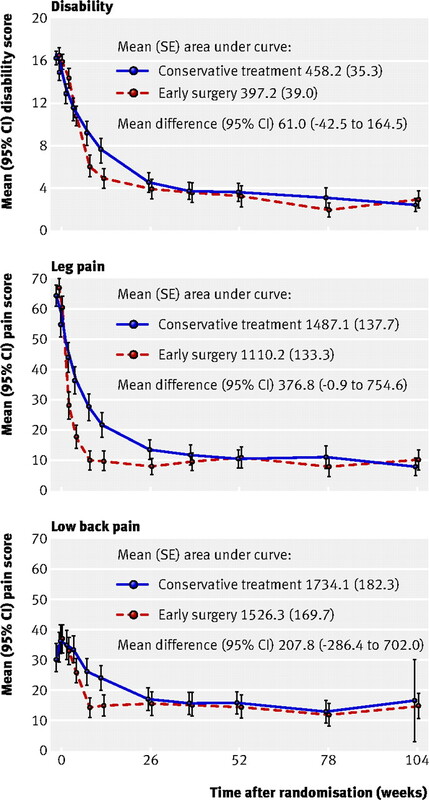 Of the 142 patients assigned to conservative treatment, 55 underwent surgery during the first year after a median of 14.6 weeks (table 1⇑) because of intractable pain (expressed by a mean leg pain score of 54 and a Roland disability score of 15.0 measured shortly before proceeding to surgery). All patients in the conservative treatment group, including those treated surgically, received prolonged conservative care by their family practitioner or neurologist. During the second year after randomisation, another seven patients received delayed surgical care because of persistent or intermittent pain, resulting in 62 surgically treated patients (44%) in the conservative treatment arm. In both treatment groups 6% of surgically treated patients had recurrent sciatica that led to a second surgical intervention during the two years of follow-up, representing 3% of the total conservative treatment cohort and 5% of the early surgery cohort. Complications occurred in 1.6% of all surgical patients, involving two dural tears and one wound haematoma. None of the complications required an intervention. None of the patients developed neurological deficit as a result of surgery or prolonged conservative care. Repeated measurement analysis of the primary continuous outcomes resulted in different courses over time for disability and pain (table 2⇓, fig 2⇓). During the first 12 weeks after randomisation, mean disability and pain scores improved significantly faster in the early surgery group, but they then converged over the next 3-6 months. The areas under the curves in fig 2⇓ were significantly different between the two groups over the two years’ follow-up for leg pain scores (P=0.05) but were not significant for the disability scores (P=0.25) and back pain (P=0.41). After the 12 week outcome assessment, no significant differences were found between the treatment groups for any of the primary outcomes at any of the remaining assessments. During the first year, early surgery achieved a faster rate of perceived recovery with a hazard ratio of 1.97 (95% CI 1.72 to 2.22, P<0.001). By the end of the first year of follow-up, however, 95% of patients in both treatment groups had experienced satisfactory recovery, and this lack of a difference between groups was maintained for the following year. Some patients, however, did experience a recurrence of problems after the first year, which resulted in 81.3% of patients in the early surgery group and 78.9% in the prolonged conservative care group having satisfactory results at two years (P=0.66) (table 2⇑). Although early surgery roughly doubled the speed of recovery from sciatica compared with prolonged conservative care, outcomes at one and two years were similar for both treatment groups. The major advantage of early surgery for patients is more rapid relief of leg pain, reassurance about recovery, and earlier return to normal activities. These relative benefits of surgery, however, were no longer significant by six months’ follow-up, and, even at eight weeks, the statistically significant difference between treatment groups in primary outcome scores was not sufficient to be clinically meaningful. Although a strategy of delayed surgery might result in some extra weeks of discomfort, up to 56% of our patients did not require surgery for recovery. Since we found similar one year and two year results for both treatment strategies, neither treatment is clearly preferable. It might therefore be time to shift from the current situation of physicians’ recommendations about the need for surgery (often based on their personal preferences) to patients deciding, with the help of their physician, which treatment strategy is best for them. Until recently, patients lacked knowledge about the risks, benefits, and alternatives of early surgery compared with prolonged conservative care, and many patients still believe that surgery is required to prevent paralysis and permanent disability. However, early surgery did not decrease the risk of an unsatisfactory outcome at one or two years’ follow-up. Although the risk was relatively low, 20% of our patients reported recurrent or chronic pain and disability after two years of follow-up. The duration of follow-up is, however, still modest, and long term follow-up for 5-10 years is needed to obtain reliable data about what proportion of patients become chronically disabled and to detect a possible difference between treatments in the risk of unsatisfactory outcome. Patients randomised to conservative care were guided by research nurses, who provided information and counselling. It was obviously impossible to blind patients to this, and practical limitations prevented the randomisation result to be concealed from the independent research nurses. Obviously, research nurses are not usually available for patient care, which might hamper the implementation of a strategy of delayed surgery in routine care. However, the nurses’ counselling function could be performed by nurse practitioners or physician assistants in the clinician’s office. In both randomisation arms, 95% of patients had reported satisfactory recovery by the end of the first year’s follow-up according to survival analysis, but at the two year assessment only 80% of all patients reported that they had recovered. Some patients who had reported complete recovery within a year of randomisation later apparently had recurrent symptoms of leg or back pain and, at two years’ follow-up, experienced no improvement or even deterioration compared with their pre-randomisation status. To solve this problem of relapse, it may be necessary to redefine “recovery” as the absence of symptoms for a certain minimum period of time. Unfortunately there are no simple statistical solutions to this problem, but the theory of multi-state models, currently gaining popularity as an extension of survival analysis, may offer an answer. Physicians guiding patients with sciatica should remember that the long term prognosis may be less favourable than is suggested by the first impression after successful treatment. Our finding that prolonged conservative care ultimately resulted in outcomes similar to those achieved with early surgery had already been reported by Weber in 1983,7 although in our study patients with intense sciatica “requiring” surgery were excluded. Since Weber reported that outcome scores converged only after four years, this study did little to reassure patients with severe sciatica that postponement of surgery might be effective in the short term and would not be harmful. After this study, several high quality observational cohort series presented significantly worse results after prolonged conservative care compared with surgery. Two studies found a threshold of two months of sciatica, after which the risk of an unsatisfactory outcome with prolonged conservative care increased.17 18 Since these studies were not based on randomised cohorts, baseline factors of patients receiving different treatments might not have been completely comparable, and therefore interpretation of the results should be cautious. From our results, it may be concluded that advising early surgery to all patients with the aim of minimising the risk of long term disability is not justified. Nygaard et al19 and Ng and Sell20 pointed out in comparable observational studies that delayed surgery after eight and 12 months of sciatica respectively produced worse results than earlier surgery. These results do not per se contradict those presented in our trial, but our data do not support the studies’ conclusions either. Indeed, it is difficult to keep patients with persistent sciatica on a conservative treatment plan for longer than 8-12 months. However, details of a strategy of surgery before eight months should be based on a randomised controlled trial that records symptoms at several different time windows. However, the general conclusions from the randomised trials by Weinstein et al,21 Osterman et al,22 and Butterman23 do not point to an unsatisfactory outcome of prolonged conservative care. From these results in conjunction with our own, we conclude that early surgery in patients with 6-12 weeks of sciatica does not lead to markedly improved functioning over the first two years. Besides an early gain in recovery in Ostermann’s and our study, surgery did not reduce the chances of unsatisfactory outcomes compared with non-surgical care. This conclusion raises doubts about whether there is an optimal timing for surgery applicable to all patients with sciatica and, indeed, whether surgery has any effect at all on the natural course of sciatica. One may decide that a randomised trial of microdiscectomy versus placebo or sham surgery is needed to evaluate the effectiveness of surgery accurately; but the risk that patients with severe sciatica would be far less willing to participate than those with mild or moderate complaints could lead to considerable selection bias. The therapeutic role of surgery for sciatica is restricted to faster recovery and relief of leg pain. This, however, may still be considered a valuable gain by a large proportion of patients who are not able or willing to await the natural course of their condition, with possibly delayed surgery. The optimal timing of disc surgery has not been defined yet. Future trials should consider alternative definitions of early versus delayed surgery. In compliance with current guidelines, the patients in our trial had experienced at least six weeks sciatica; for defining the optimal time for surgery, it might be more appropriate to compare delayed surgery with surgery within two or four weeks of the start of symptoms. Frymoyer JW. Back pain and sciatica. N Engl J Med1988;318:291-300. Vroomen PC, de Krom MC, Knottnerus JA. Predicting the outcome of sciatica at short-term follow-up. Br J Gen Pract2002;52:119-23. Stam J. [Consensus on diagnosis and treatment of the lumbosacral radicular syndrome. Dutch Society for Neurology]. Ned Tijdschr Geneeskd1996;140:2621-7. Koes BW, van Tulder MW, Peul WC. Diagnosis and treatment of sciatica. BMJ2007;334:1313-7. Mayer HM. [The delayed OP—indications for surgery of lumbar disc herniations]. Z Orthop Ihre Grenzgeb2005;143:287-91. Vader JP, Porchet F, Larequi-Lauber T, Dubois RW, Burnand B. Appropriateness of surgery for sciatica: reliability of guidelines from expert panels. Spine2000;25:1831-6. Weber H. Lumbar disc herniation. A controlled, prospective study with ten years of observation. Spine1983;8:131-40. Weber H. Lumbar disc herniation. A prospective study of prognostic factors including a controlled trial. Part I. J Oslo City Hosp1978;28:33-61. Cherkin DC, Deyo RA, Loeser JD, Bush T, Waddell G. An international comparison of back surgery rates. Spine1994;19:1201-6. Peul WC, van Houwelingen HC, van den Hout WB, Brand R, Eekhof JA, Tans JT, et al. Surgery versus prolonged conservative treatment for sciatica. N Engl J Med2007;356:2245-56. Peul WC, van Houwelingen HC, van der Hout WB, Brand R, Eekhof JA, Tans JT, et al. Prolonged conservative treatment or ‘early’ surgery in sciatica caused by a lumbar disc herniation: rationale and design of a randomized trial [ISRCT 26872154]. BMC Musculoskelet Disord2005;6:8. Collins SL, Moore RA, McQuay HJ. The visual analogue pain intensity scale: what is moderate pain in millimetres? Pain1997;72:95-7. Prolo DJ, Oklund SA, Butcher M. Toward uniformity in evaluating results of lumbar spine operations. A paradigm applied to posterior lumbar interbody fusions. Spine1986;11:601-6. Brazier JE, Harper R, Jones NM, O’Cathain A, Thomas KJ, Usherwood T, et al. Validating the SF-36 health survey questionnaire: new outcome measure for primary care. BMJ1992;305:160-4. Atlas SJ, Deyo RA, Keller RB, Chapin AM, Patrick DL, Long JM, et al. The Maine lumbar spine study, part II: 1-year outcomes of surgical and nonsurgical management of sciatica. Spine1996;21:1777-86. Hurme M, Alaranta H. Factors predicting the result of surgery for lumbar intervertebral disc herniation. Spine1987;12:933-8. Rothoerl RD, Woertgen C, Brawanski A. When should conservative treatment for lumbar disc herniation be ceased and surgery considered? Neurosurg Rev2002;25:162-5. Nygaard OP, Kloster R, Solberg T. Duration of leg pain as a predictor of outcome after surgery for lumbar disc herniation: a prospective cohort study with 1-year follow up. J Neurosurg2000;92:131-4. Ng LC, Sell P. Predictive value of the duration of sciatica for lumbar discectomy. A prospective cohort study. J Bone Joint Surg Br2004;86:546-9. Weinstein JN, Tosteson TD, Lurie JD, Tosteson AN, Hanscom B, Skinner JS, et al. Surgical vs nonoperative treatment for lumbar disk herniation: the spine patient outcomes research trial (SPORT): a randomized trial. JAMA2006;296:2441-50. Osterman H, Seitsalo S, Karppinen J, Malmivaara A. 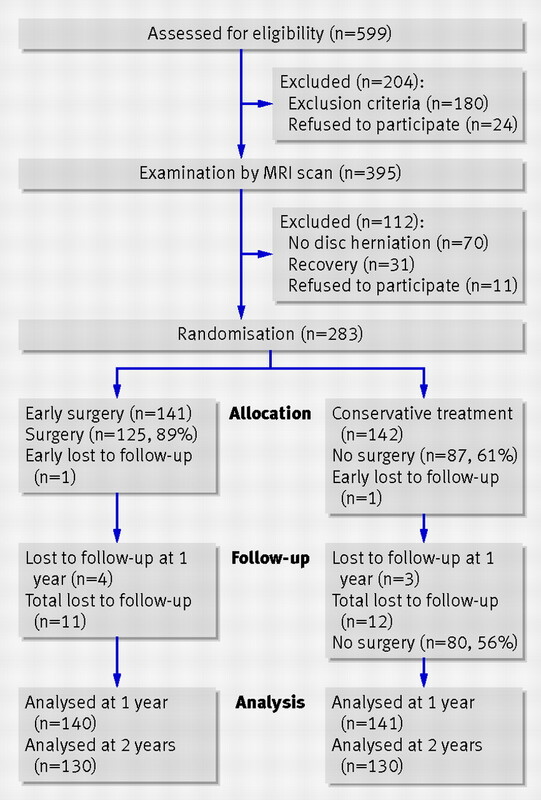 Effectiveness of microdiscectomy for lumbar disc herniation: a randomized controlled trial with 2 years of follow-up. Spine2006;31:2409-14. Buttermann GR. Treatment of lumbar disc herniation: epidural steroid injection compared with discectomy. A prospective, randomized study. J Bone Joint Surg Am2004;86A:670-9.